DIE WITH ME is the debut novel from Elena Forbes and is a police procedural set in and around the leafy London suburb of Barnes. More by luck than judgement, the death of teenager Gemma Kramer is classified as suspicious rather than accidental, after she fell to her death from a balcony in a deserted church. A witness saw Gemma kissing a much older man in the church doorway and examination of her computer reveals emails from a man calling himself Tom that are encouraging Gemma to meet him, to carry out a joint suicide pact. The investigation is initially headed by DI Mark Tartaglia who soon believes that 'Tom' has acted before. His team track down the files of two other young victims plus an older woman who died from a fall close to where Gemma had died, who may or may not be another one of his victims. 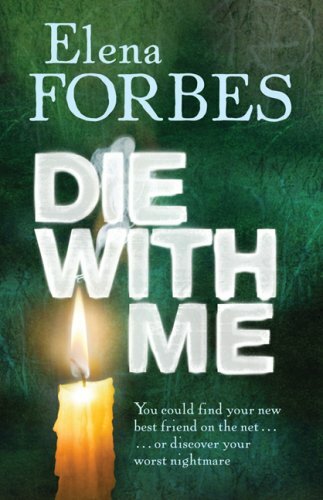 DIE WITH ME is an extremely enjoyable read with an unusual plot line. Tom is either a complete stranger or he's one of the non-police characters introduced and as the story progresses the suspicion is thrown on to one then another of the possible suspects. Tartaglia and his main sidekick, Sam Donovan, are well fleshed out though most of the other characters in his team are little more than names. The story is well paced, with no sagging in the middle, and good use is made of the waterside location of Barnes with events occurring around both a canal and the river. A very pleasing debut and it certainly looks like a sequel is planned which, when available, will be added to my 'can't wait to read' pile. Read another review of DIE WITH ME.